This spring I finally got around to ordering (bare root) rose bushes from David Austin Roses. I ordered a Boscobel and Claire Austin. The Boscobel is a a salmony-pink, and Claire Austin is white. Both are very fragrant. The last time I attempted to grow a Boscobel it didn’t survive the winter as I hadn’t planted it deep enough; I definitely did not make that mistake this time around! They arrived just a couple of weeks ago. I soaked them in a bucket over night and planted them. They have some leafs starting to sprout up nice now. I can’t wait for them to bloom this summer and just get bigger and better over the next years! Here are photos from David Austin’s site of these beauties. I’ve been in a crocheting and knitting frenzy the last couple of months. Christmas is right around the corner and I am trying to get gifts made. The above is my latest project now that I’ve got a bunch of scarves done. It’s a rectangle granny pattern. I’m using worsted weight yarn and an H hook. I’ve got at least 1 more round of each color to go, and then the fun of weaving in ends and blocking. 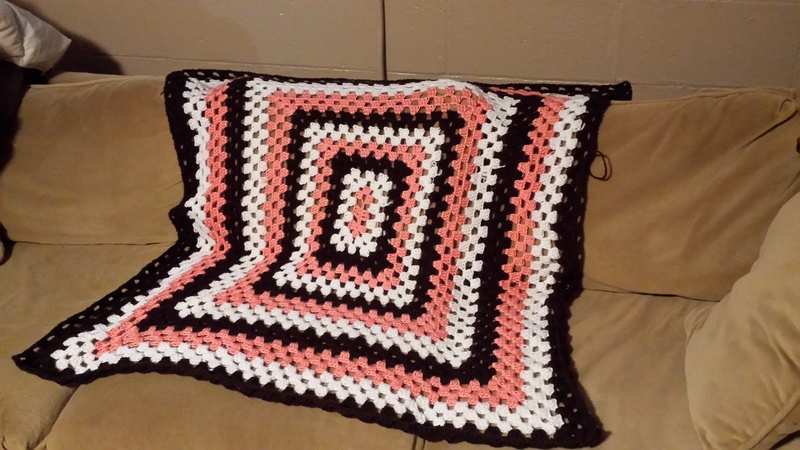 Since the pattern called for a chain 2 between each set of 3 double crochets, the gaps in it are bigger than preferable for a lapghan. I’ve decided I’ll line the back with a layer of fleece. That will add extra warmth and snuggliness, especially since the person it is going to doesn’t have the warmest house during the winter. Although I am personally not a huge fan of pink, I think the colors look great together. I am hoping the person it is for is going to love it as well. Now, I’ve got more crocheting to do before my 5 year old gets home from school! I also planted about 120 little crocus bulbs (caroms?) But no pictures of those. 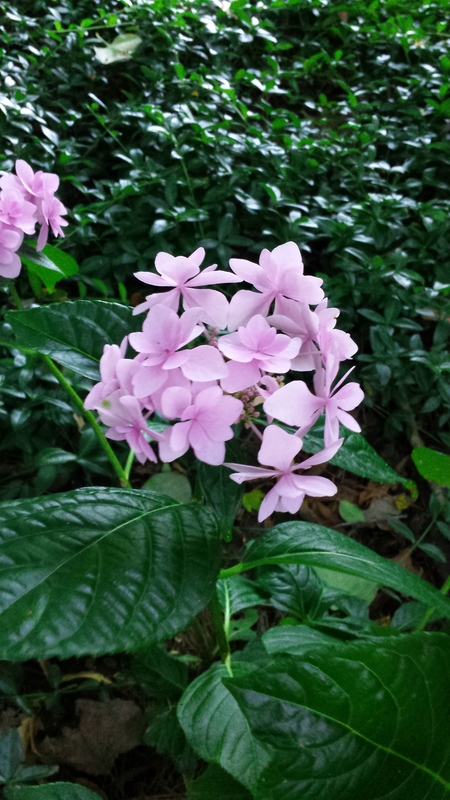 I am super excited about them blooming in the spring in all the different areas of the yard. Hoping the chipmunks don’t treat themselves to them first. Hey Look! 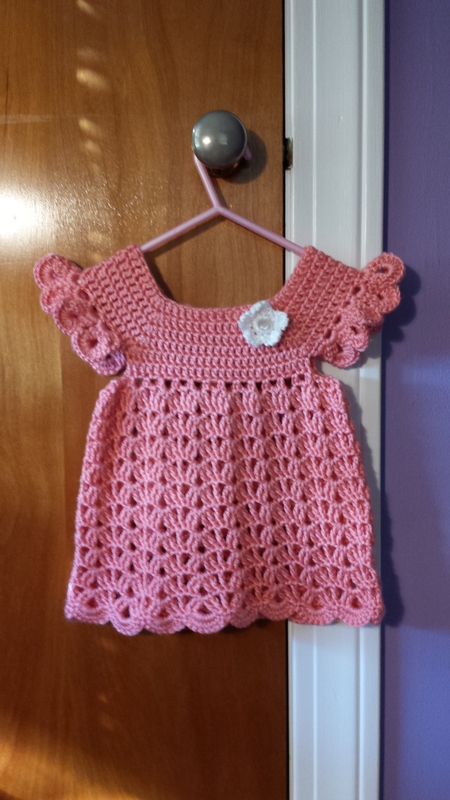 That Angel Pop-Over Crochet Dress I was working on, well it’s all done! All the loose ends have been weaved in (or is it woven in?). I crocheted a flower and attached it and then sewed a cute pearlescent button in the center of the flower. I am so freaking proud of this little dress! 🙂 It’s a cute birthday present! I finally was brave enough to attempt to crochet an article of clothing. (No, I never did finish that tank I started many moons ago.) Baby items are so nice to try something new with since they are smaller, quicker projects than the adult versions. Lucky for me my little niece has a birthday coming up and I found some beautiful pink yarn at the local store the other day. It was time to try something new and take a risk. Moroccan Mint Green Tea is a fairly low priced green tea offered by Teavana. Upon opening the package, it definitely smells minty with a nice grassy green tea smell. The smells dissipate during the brewing and the brewed tea doesn’t taste as strong as the leaves initially smell. This flavor is one of the least expensive of Teavana’s green teas. That being said, it is a no-nonsense minty green tea. The ingredients are “Green tea and spearmint leaves”. No extra flavors, no extra frills. Not a bad tea for those on a budget. My definitely PINK Stargazer Hydrangea in bloom. 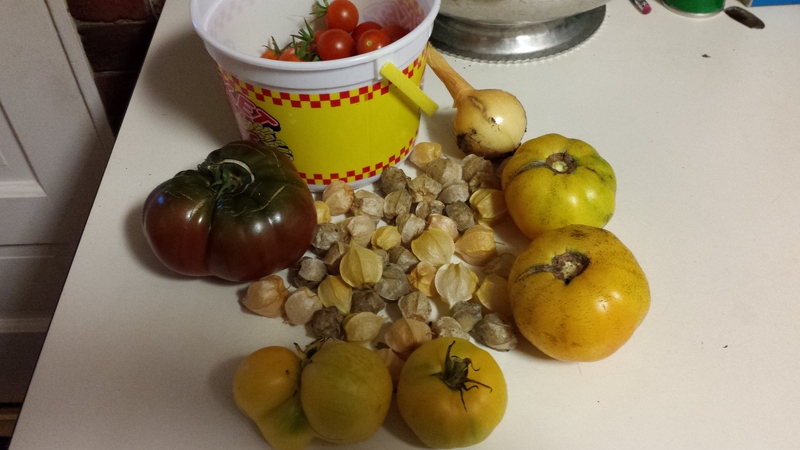 Some of the first bounties of my garden earlier in August.